You have to pick often to keep up with everbearing raspberries, though it's a welcome task. The author's canes grow to more than 7 feet tall every year. You may think the sheer gustatory pleasure of wolfing down ripe, juicy raspberries, whose flavor explodes in your mouth, is reason enough to grow them. Well, think again. Raspberries are not just another tasty berry; they are loaded with healthful attributes. They're high in fiber and contain vitamin A, folate, antioxidants, and numerous minerals; the juice contains vitamin C; and those sometimes-annoying little seeds contain vitamin E. And, of course, if you have a raspberry patch, you have endless dessert possibilities. 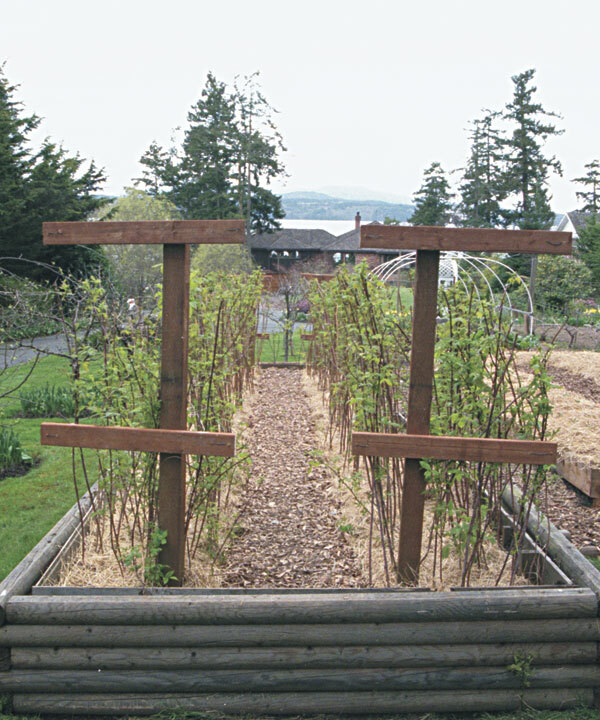 The key elements to raspberry success are careful selection of plant type, a good solid trellising system, and husbandry techniques that match the needs of the plant. Once everything is in place, your raspberry patch will provide you with many years of satisfaction. 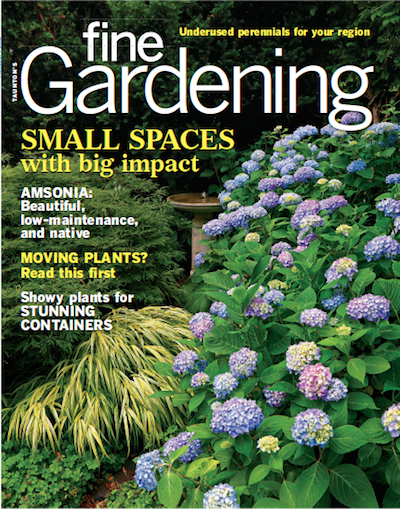 Subscribe to Fine Gardening magazine to learn more about growing your own fruit. 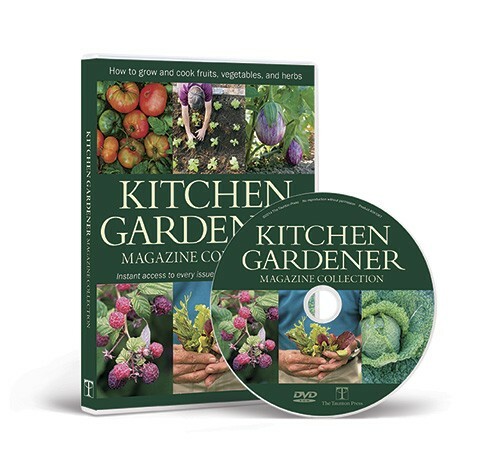 In fact, you’ll find instruction and inspiration for gardeners of every skill level. Why choose an everbearing variety? We chose a classically red, everbearing variety called 'Summit', after asking our local agriculture office which raspberries are recommended for our area. We also taste-tested berries from local berry farms (an important step) to determine our favorite. We then shopped around for rooted canes that were certified disease-free. 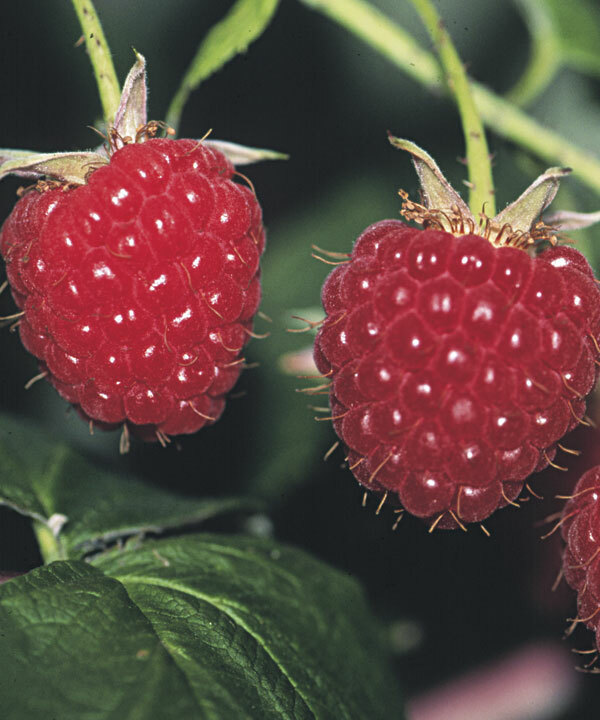 Various raspberry cultivars will flourish from Zones 3 to 10. A little homework will get you, too, the right raspberries for your location. Take your time in selection, because raspberries come in varying shapes, sizes, and colors—red, purple, golden, white. So why did we choose an everbearing variety? We love raspberries. We're willing to pick fruit every day until frost so we can eat our fill, give some to the neighbors, freeze some for winter, and leave the rest to the birds. Summer-bearing raspberries fruit for about a month, then it's all over (the fruit and the work) until next year. Everbearing raspberries, treated well, are just that—ever bearing. One mild winter we found a few ripe berries still hanging on in December. Once established, everbearing raspberries — called fall bearing by some—begin production in our area in July. The canes are usually so loaded down, they bend far over their support wires. Summer-bearing varieties generally fruit earlier, usually by a few weeks, so we also planted a few bushes of wine-red 'Brandywine' to enjoy while we wait for the heavier-producing main crop. For variety, we added the yellow-tinged 'Golden', which is everbearing. 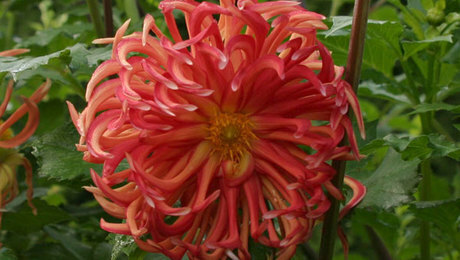 Other similar varieties are 'Fall Gold', 'Golden Summit', and 'Golden Harvest'. 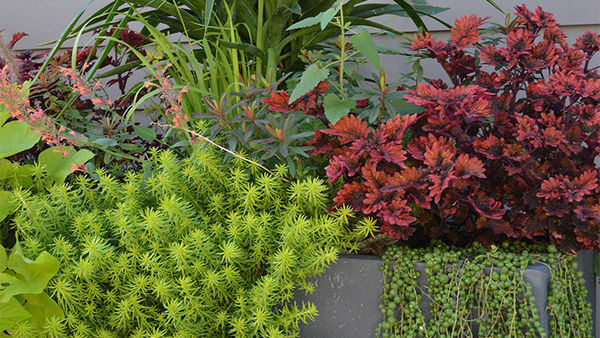 The classically red everbearing variety 'Summit' has yielded from July into December in the author's Pacific Northwest garden. 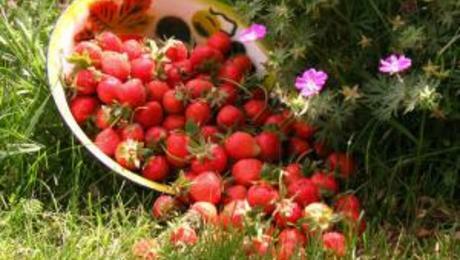 'Brandywine' produces fruit several weeks before 'Summit' does. 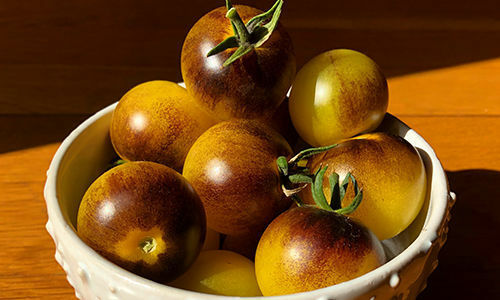 'Golden' is a yellow-tinted everbearing raspberry. How many plants, and how big a patch? Raspberries multiply precociously, prodigiously, and prolifically. If you plant one cane this year, you will have a dozen or more in the same spot next year. Raspberries are joyfully exuberant about procreating by underground runners, poking up impressive numbers of healthy new plants all around your original patch. I don't consider this to be a problem, though, because one whack of the hoe takes care of them. You can also present them to a friend or use them to extend your patch. Our two-row raspberry patch is 7 feet wide by 33 feet long. If I were to do it all over again, it would be 9 or 10 feet wide to allow more elbowroom for picking between the rows. We have 3 feet between rows, which is just barely enough. Four to 6 feet would be better. 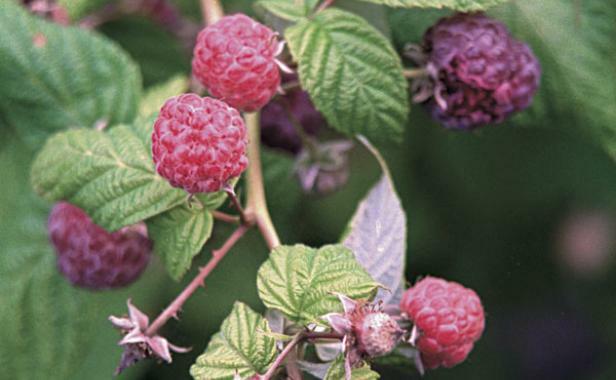 Raspberry plants hate wet feet, and they are gross feeders. We addressed these two critical points by building a 20-inch-high raised bed and filling it with a mixture of four-fifths good garden topsoil blended with about one-fifth sand, peat, and well-rotted manure. If, like us, you have acidic soil, you will also need to add some lime, because raspberries prefer a soil pH of around 6.0. We left one end of the box open to allow easy access with our wheelbarrows, then closed it in when the box was full. This job can be done in the fall, so you are ready to plant, come spring. If you have rich, deep soil that drains well year-round, you can simply plant your raspberries in a permanent garden site. Not us. 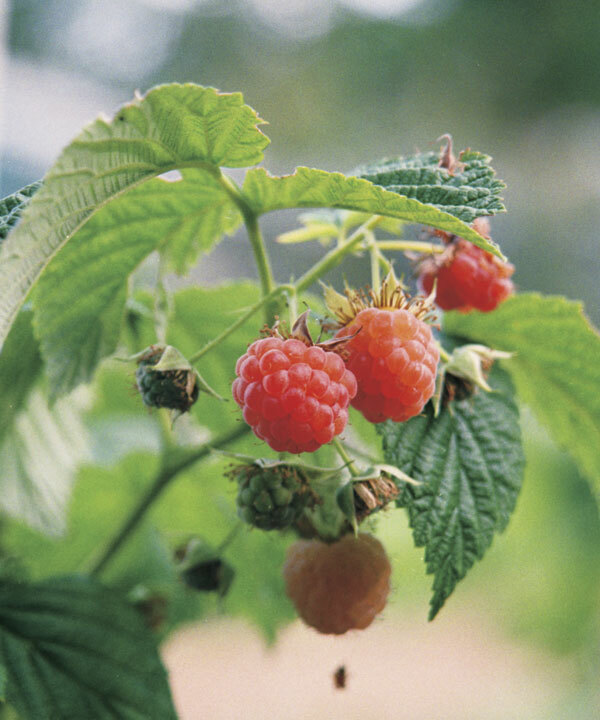 The Pacific Northwest gets rain all winter, and many gardeners lose raspberries to root rot because they make the mistake of planting their raspberries' fussy little toes directly in the ground, which is often soggy clay covered with a skim of topsoil. We also experience a two-month drought most summers. Raised beds allow us to have deep soil that holds moisture evenly yet drains well. It is important that you do not establish your raspberry patch in an area where you have recently grown tomatoes, peppers, or potatoes, to avoid verticillium wilt, which these vegetables can carry, and raspberries can catch. 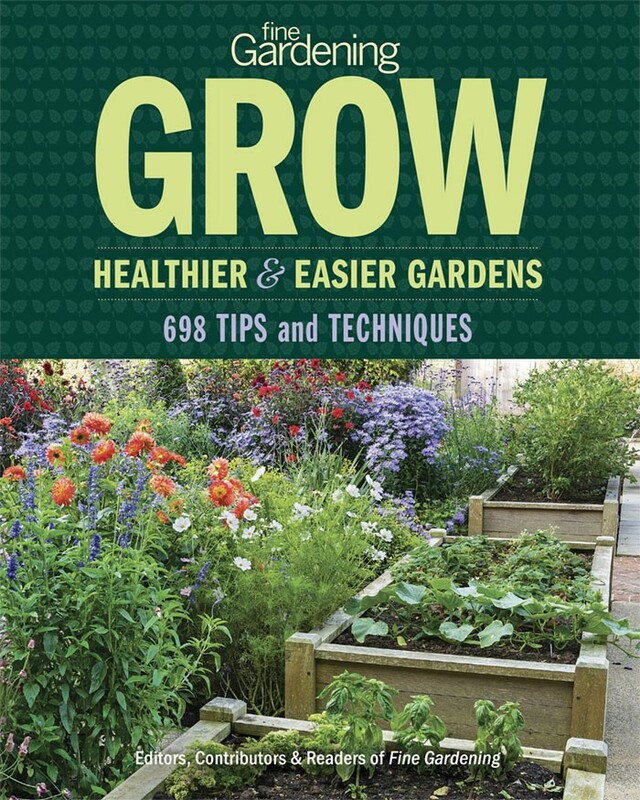 On our sister site, VegetableGardener.com , we have many articles and videos on building raised beds . We also have a raised bed gallery , with most of the photos posted by site members. 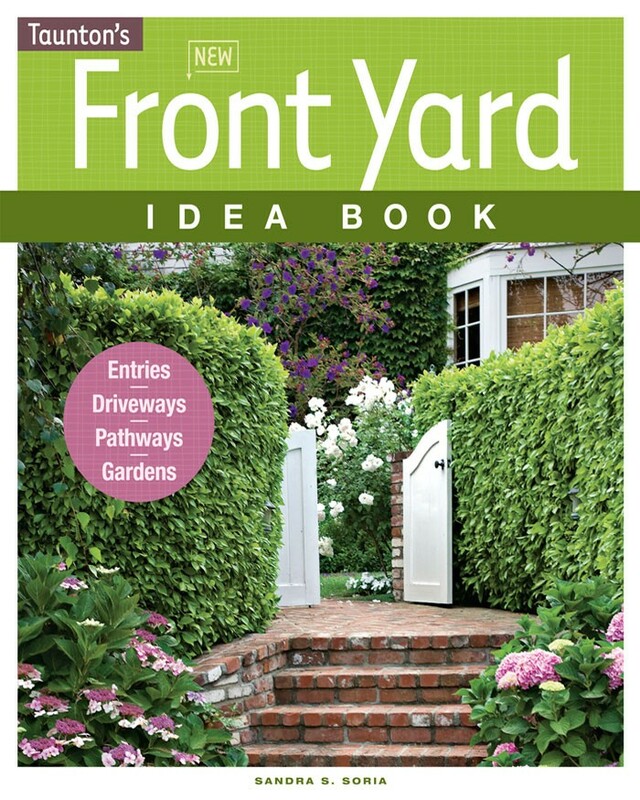 Check them out for design and construction ideas. 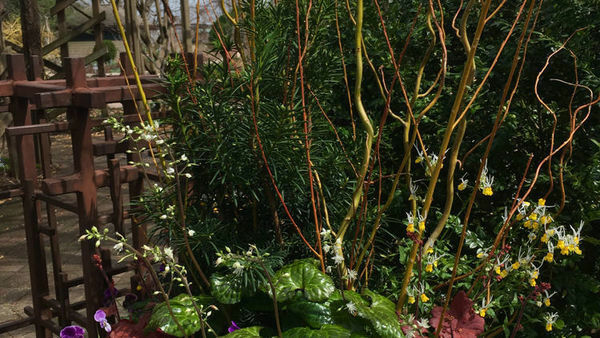 The best time to find plants, early spring, is also the best time to plant them, although you can put raspberries in anytime in the summer if you come into some healthy gift plants. 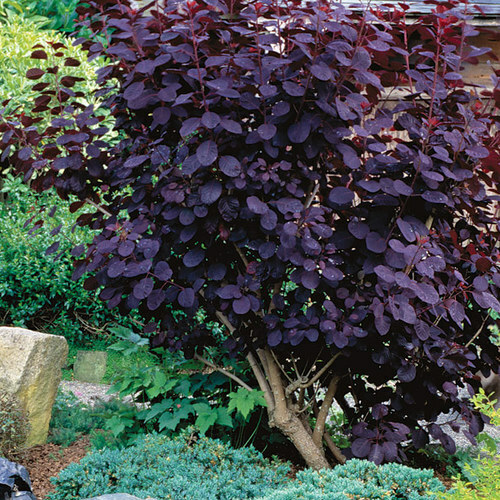 Spring plants will establish better, though, and may well give you a few berries their first summer. I soak bare-root plants in a half-strength solution of vitamin B1 growth stimulant (1/2 teaspoon per quart water) for about six hours (see Give your rootstock a healthy start). Don't delay planting. The small plants will not stand for soaking longer than a day in the B1 solution, and they will die quickly with dry roots. 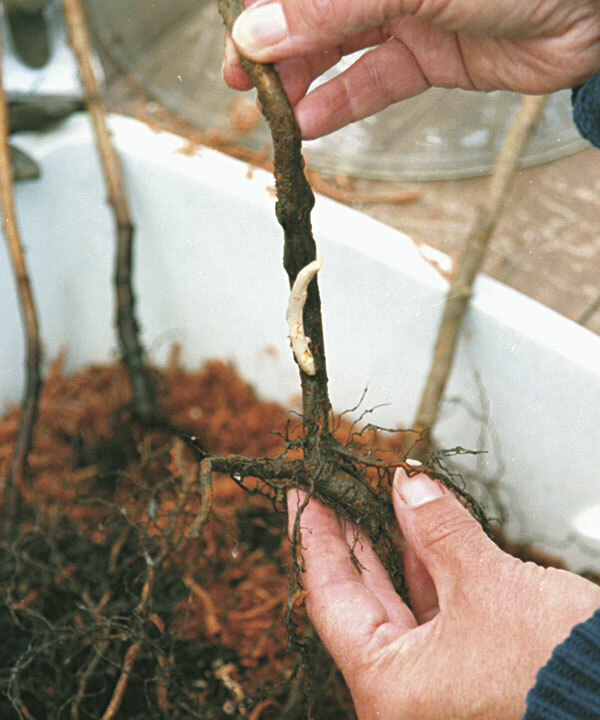 Should you receive dormant bare-root plants by mail before you are ready to plant, put them in the fridge to keep them dormant. 1. 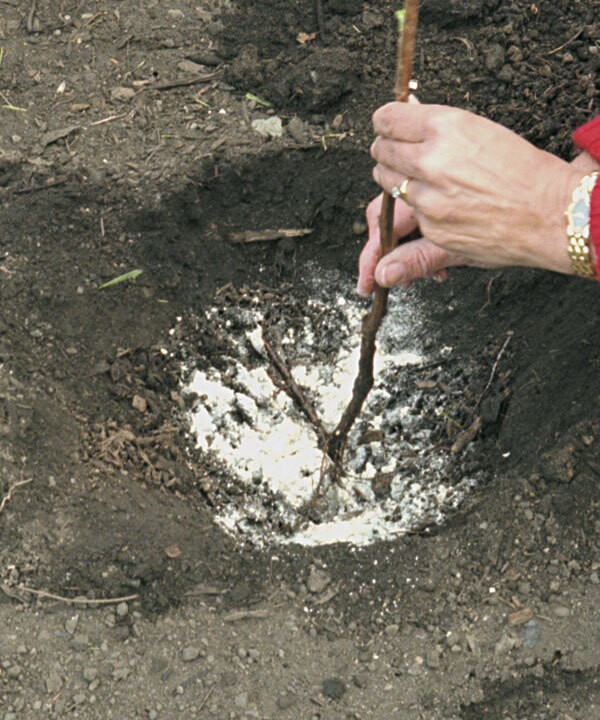 To plant raspberries in early spring, check bare-root plants for signs of life. The sprout on this stem ensures the likelihood of a take. 2. Soak bare-root plants in half-strength Vitamin B1 growth stimulant for about six hours. 3. 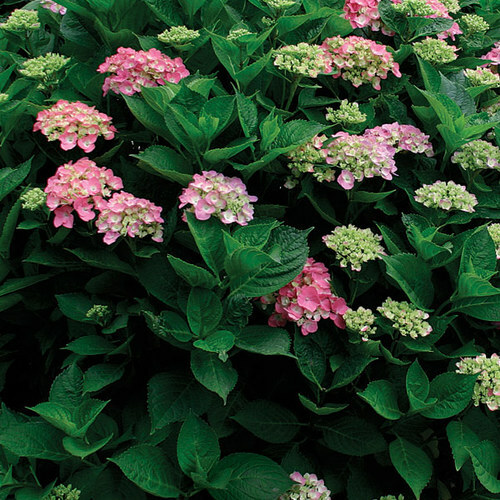 Plant in a 1-foot-deep, 1-foot-wide hole with a handful of rotted manure and organic fertilizer. 5. Mulch to retain moisture. 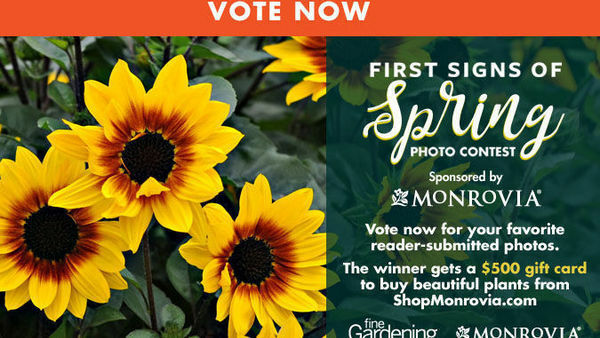 Have on hand some well-rotted manure, mushroom manure, or compost; organic fertilizer (see Organic fertilizer mix for raspberries), or 4-20-20; a water source; and some mulch. We use straw for mulch, but other materials will do just fine. I know a man who uses ripped-up newspaper. Dig a hole 1 foot deep and wide per plant. In our case, we set the plants 3 feet apart in the row. Put a handful each of rotted manure and fertilizer in the hole. Add some water, pop the plant in, then carefully tuck the soil around and over its spread roots to make a small depression or basin at the surface, a place for rainfall to accumulate. 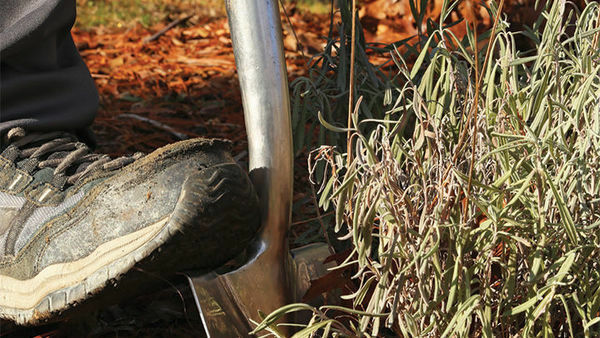 Sprinkle some more rotted manure in this depression to provide a jump start for growth, then cover the ground around the plants with your mulch — no more than 3 inches deep. We laid landscape cloth over our path between the rows and covered it with wood chips. 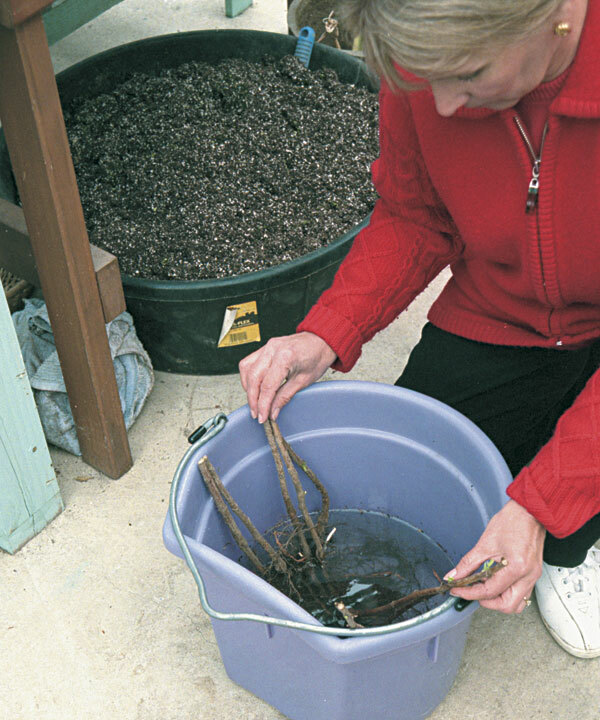 Drip irrigation is the ideal way to water raspberries, and this is the easiest time to install it. I make this up each year in a big rubber horse-feeding trough. If you use this mix just before your raspberries blossom, reduce the amount of canola/fish meal by half (to 2 parts), as the plants need less nitrogen then. 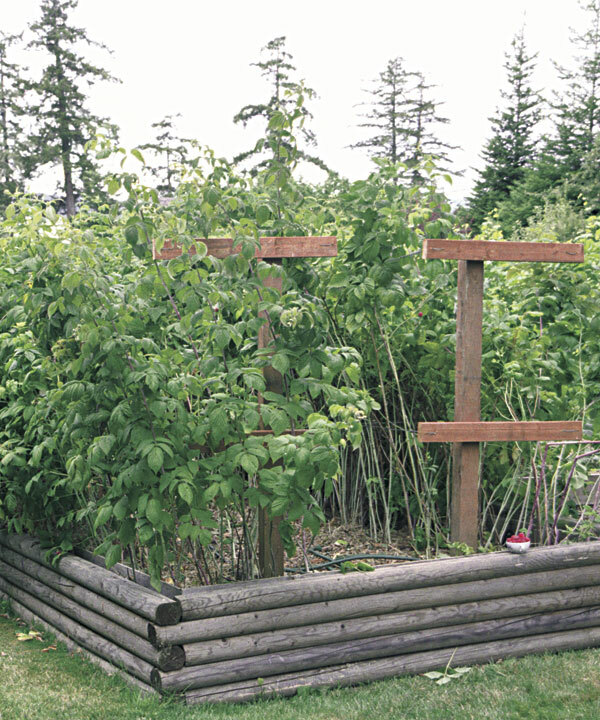 A raspberry plant laden with fruit is top-heavy and needs support to keep it from falling over. Because we wanted our raspberry patch to last a long time, we began with a formal support system. At the end of each row of raspberries, we buried a 6-foot post 1 foot in the ground. Across the top and middle of each post, we fastened 30-inch crossbars with sturdy screws. We then stretched lengths of 16-gauge wire from the ends of each crossbar. In the beginning, we used only the top wire, but we found that some of the plants bearing fruit would fall over before they ever got to the top wire, so we added a second tier of wires about 2 feet off the ground. Sometimes the wires stretch from the weight of the plants and fruit, so we tighten them in early spring when we are pruning. The smooth green 1-year-old canes and the rougher brown 2-year-old canes are easy to tell apart. Each spring, 1-year-old canes are trimmed back to below the fruiting area, and 2-year-old canes are removed completely. 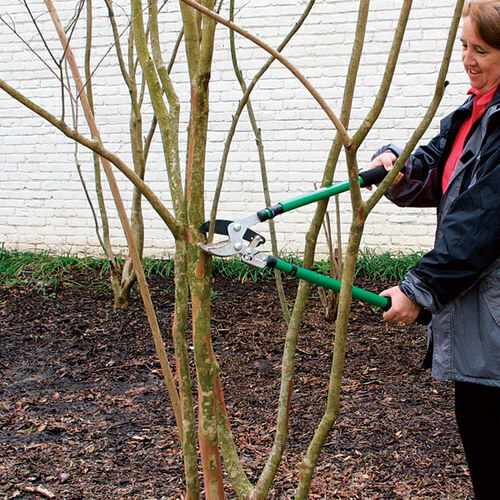 The main purpose of pruning is to get rid of older canes in favor of newer canes that will produce fruit. In late summer, some of your newly planted canes will begin to fruit at the top of the cane and continue into the fall. In the early spring of the following year, while the plants are still dormant, it's time to prune these now 1-year-old canes, and here is where we do something special. Instead, the first spring, we cut the 1-year-old canes back to below the fruiting area, level with the top support wire. These shortened canes begin fruiting in July. In the meantime, leafy new canes, called primocanes, grow rapidly up from between the old canes. These new canes will flower and fruit later in the summer. We thin them out and clear away those suckers that popped up around the patch. The following spring, we remove the 2-year-old canes completely to make room for new growth, cutting them off at the ground, and we trim back the 1-year-old canes. We usually top-dress our raspberry patch with well-rotted manure and berry fertilizer in early spring. 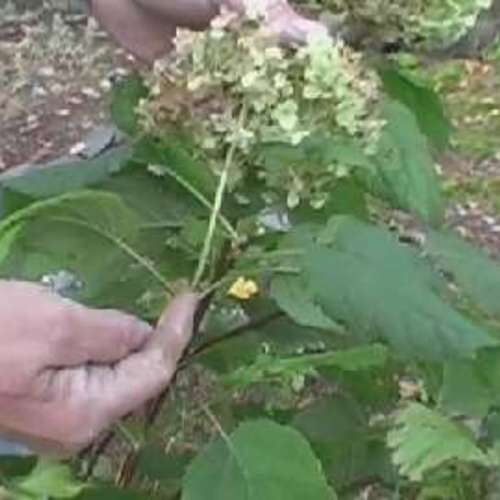 You can also prune summer-fruiting varieties using this method. 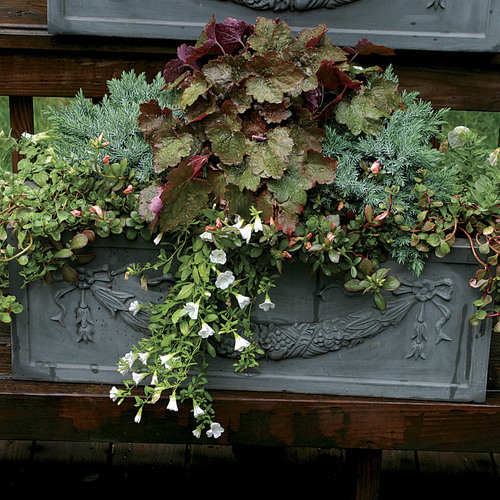 To keep your plants healthy and productive, make sure they don't dry out in the summer. Remember: damp in summer, dry in winter. 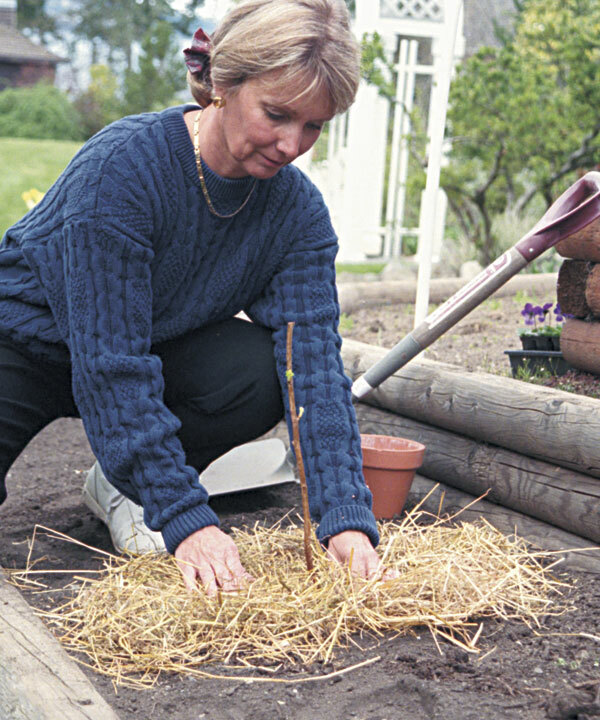 Spread straw or other mulch around the roots to help keep in an adequate supply of moisture. 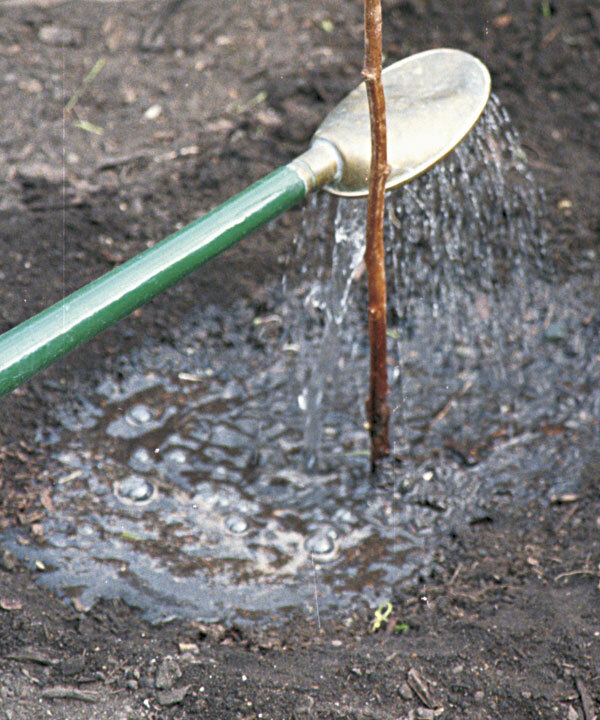 If you don't have a drip system, a soaker hose used for an hour or two each week should do the trick. 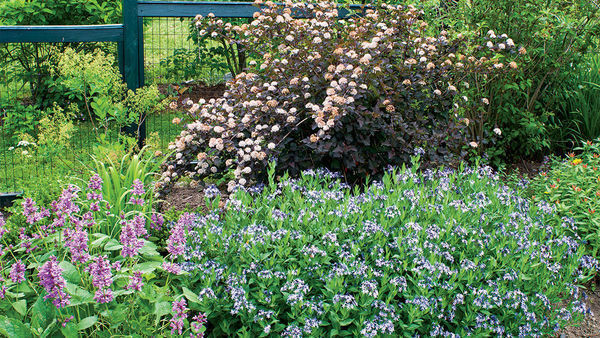 In subsequent years, remember to top-dress the freshly pruned plants with several inches of well-rotted manure or compost, fertilizer, and, if necessary, a sprinkling of lime. Raspberry plants need a significant amount of nitrogen to grow to their full 6 or 7 feet, but you should stop pushing high-nitrogen fertilizer on them as fruiting time approaches. At this time, the plants must concentrate on producing fruit instead of leaves. Using the homemade organic fertilizer on the facing page allows the plants to receive the nutrients they need when they need them. 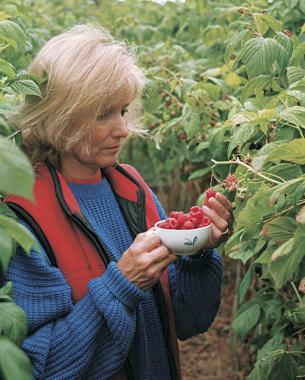 We have found our raspberries to be remarkably free of pests and diseases. This is a good thing, because we are not fond of pesticides (or bugs). Some of the critters that can attack raspberries are nematodes, root or bud weevils, aphids, fruit worms, and crown borers. This latter problem involves maggots girdling the emerging canes, which may then break off at soil level or produce a poor crop. If you cut the canes to the ground, you can confound the borers and avoid drenching the root zone with an insecticide. 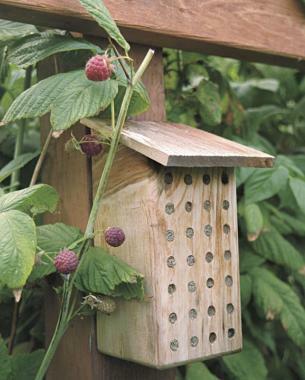 To ensure pollination of your raspberries, build a simple orchard mason bee house by drilling holes in a 4×4 and giving it a shingle-roof overhang. Secure the house to a sunny trellis pole, and the bees will come. 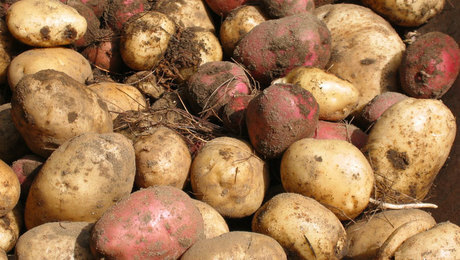 A few diseases you may encounter are fruit rot, root rot, and spur blight. Fruit rot is a fungus that sets up housekeeping when canes are too crowded. 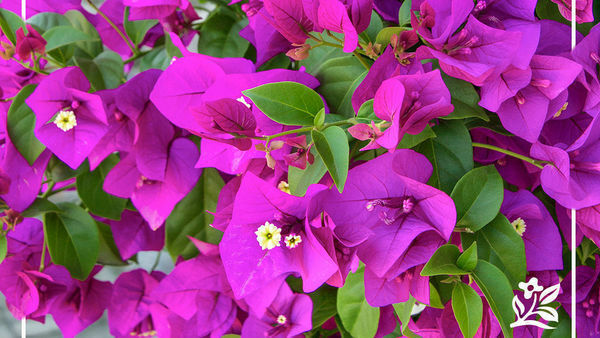 The remedy is to prune for openness and to pick frequently in wet weather. Avoid overhead watering and prune out fruiting canes after harvest. Root rot results in the sudden death of the plant right after flowering, when the weather turns warm. 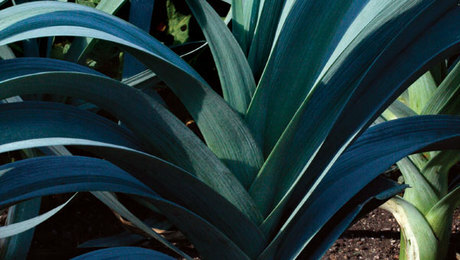 The only remedy is to plant resistant varieties in friable, well-drained, rich soil. 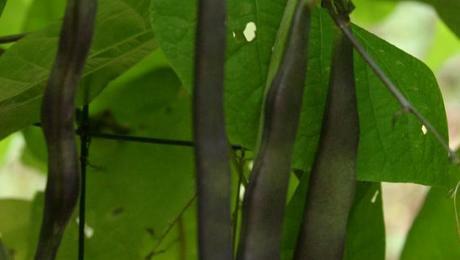 Spur blight shows up as dark chocolate-colored blotches on primocanes in mid-summer to fall when humidity is high. 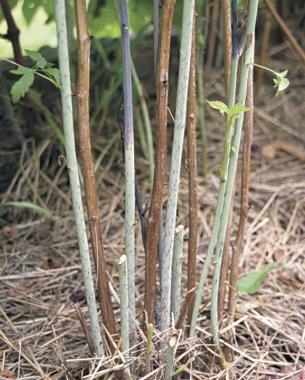 Infected areas on overwintered canes are silver gray and produce millions of spores. Lime-sulphur solution applied as a dormant spray and good air circulation provide adequate prevention. On the flip side of pest control, we have encouraged healthy pollination in our raspberry patch by building a simple home for orchard mason bees, which we attached to one of the trellis poles. It's just a length of 4×4 with 5/16-inch holes drilled in it and an overhanging shingle for a roof; the orchard bees take up residence in the holes and proceed to do their thing. Raspberries aren't the only berries you can grow in a home garden.For information on growing and using all kinds of berries, see VegetableGardener.com. What to do with all those berries? I acquired my picking skills early. The eldest of five prairie farm kids, I had many domestic duties, including picking wild berries. "Never eat them until you are finished picking," was my mother's strict rule, and it is still a good one. We eat them as desserts of all kinds, ranging from ice cream topped with berries or berries topped with ice cream and a mint leaf, to fancy cakes layered with mashed berries and chocolate and decorated with wild abandon. We make bumbleberry pies from a mixture of our own summer fruits. We also freeze great quantities of raspberries to remind us in the winter that summer once existed and will again. Freezing raspberries is easy. Simply spread clean, firm berries on a cookie sheet and pop it in the freezer. When frozen, the berries roll nicely into ziplock bags. The sweetest berries are from the heat of summer. They will keep until the following summer and are sheer ambrosia on pancakes or waffles. And all of the options that were open to you when they were fresh are still there. You can still, for example, make raspberry vinegar with frozen raspberries, and you can spread sound berries over a salad to give it a special zing, certain to bring raves. Raspberries keep well in the fridge for a few days, especially if you have picked them cleanly and discarded any mushy ones. An ice cream pail or any other plastic container with its lid on is all you need. I don't can raspberries, but some people do. Instead, I mix them with pulp from the golden plums that grow on our ancient trees to make a jewel-toned jelly. Raspberries also make a great sauce, which can be frozen and used hot as the crowning touch on a simple dessert, or cold as a coulis. Raspberry juice can be mixed with soda to make a refreshing drink. The possibilities are endless. You can even ignore my mother's rule and pop them in your mouth as you pick them. Chicago area, summer blooming razzberry, year 3, plant has weak shoots which are dying and the leaves are drying up. Any suggestions or it is a sick plant? Beware: we have a yellow berry variety here in northern New Hampshire. This plant has spread and invaded our flower garden, sent shoots under our stone wall to invade another flower garden. I'm glad it's successful but just spent the day digging and pulling shoots and roots. Plant this in an area you don't mind how far it spreads! There is something to be said for buying one's berries from a nearby organic farmer. I have spent two weeks removing raspberry and blackberry (even tastier and far harder to pull up with more scratches) from what is supposed to be a garden. Hello. Enjoyed this article. I have a question. I was gifted some raspberry plants last spring and planted them in a row. Deer came along and "topped" all of the plants when they were about 30" tall and then a few weeks later again " topping" all the side branches that were forced by the first attack. Now of course all I have are a row of useless 2.5 foot tall bushes. So now my question is, aside from keeping the deer away, what do I need to do to the plants between now and next spring so that I can bring the sets of root stock back to my dream of having a decent raspberry patch? 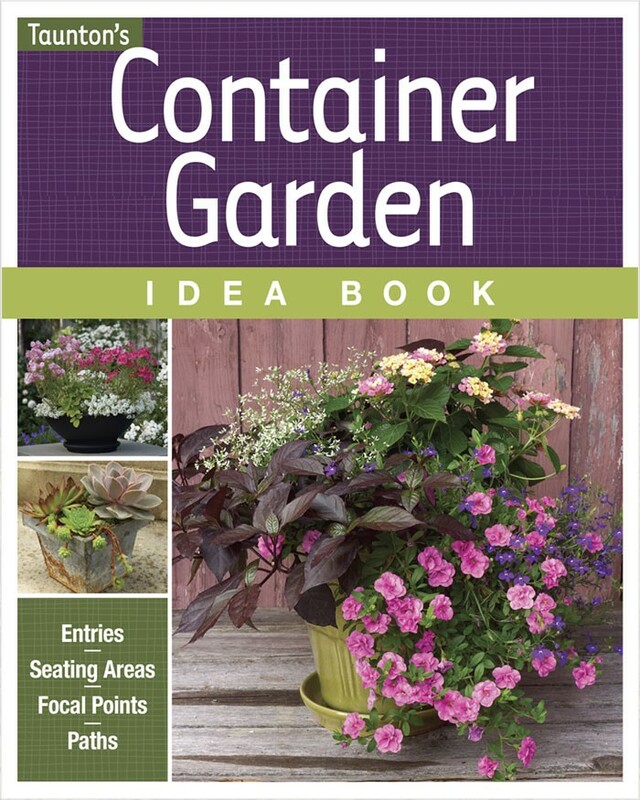 I guess what I need to know first is how to winter the plants so I can start over next spring? Thanks for any help or directions on this. can I use cottonseed meal instead of canola seed meal? can the same fertilizer be applied to blueberries too thanks. Also what is the measurement for application and how and when during the year. Great article. I referenced it in my blog. Hello! Thanks for this article. We're also in the pacific nw. I'm planning on planting our raspberries on the line of our property that borders a drainage ditch. I'm thinking that will help to drain extra moisture during our winter months. What are your thoughts, yes, no? Also when you say and "some lime" to your soil mix how much are you talking about. I'm planting 4 canes spread over a 6' wide x 16' long x 18" high box. So I need some advice. I've never gardened before but I recently moved to a place with a huge yard so I figured I'd give it a try and so far it's been a disaster. I have 2 raised garden beds in the front yard. The strawberries & zucchini starts I planted about 3 weeks ago are still alive and green but the peppers are an EPIC FAIL. My biggest concern is the 3 raspberry canes & 1 boysenberry plant I tried planting in the back yard along 2 sections of fencing this weekend. I apperantly did a few things wrong so I would just like somebody to tell me if they think they'll survive. Here is what happened. so I live in eastern WA the soil is hard & dry but when it gets wet it's slick so I guess that's clay soil? Anyways to prep the area along 2 opposite fence sections (each section is approx 10ft long x 3ft wide) I dug up the weeds, loosened the soil and then added 3 bags of top soil, 2 bag of organic compost and 1 bag of shredded bark/mulch. I mixed thst using a small cultivator and then mixed in 1/4c Scott's all purpose vegetable continuous release plant food 10-10-10 to each of the 2 sections. I planted the bare root raspberry canes in one section about 3 ft apart 6-8" deep, so that only the 80% of the cane was above ground. the live boysenberry was planted approx 20 ft away from the raspberry plants, 6-7" deep so all roots & the bottom 1" of the cane were buried. I had been watering them by hand the 1st 3 days but today I turned on the irrigation and 1 sprinkler head hit that area hard and drenched my soil, like thick Mudd consistency so I freaked. I carefully dug up all my plants & rinsed the Mudd off the roots. Then went and got a small wheelbarrel of dry dirt from the horse arena to mix into the top few inches of muddy soil. I carefully replanted the canes the right way according to google, spreading out the roots and only burying them , 1-2" deep. I did the same thing with the boysenberry plant. I read online that I wasn't supposed to mix fertilizer in the soil cuz it will burn the plants or something but obviously can't undo that so my question is this. Considering that I did mix fertilizer in the soil, drench the soil and then had to replant the bare root canes/plant how tramatized do you think the plants are? (the raspberry canes were dorment but the boysenberry plant was live) Do they stand a chance at making it? Hi Melissa. 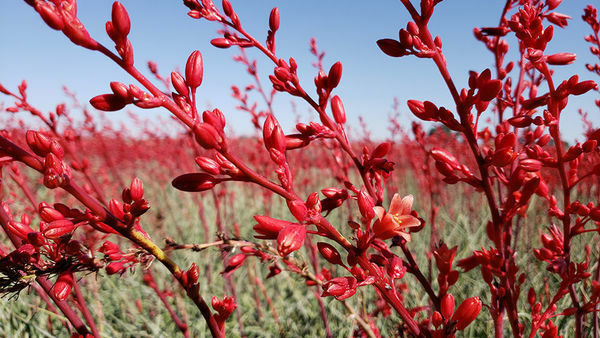 I grow in central Oregon with high desert climate. We likely share challenges, as berries tend to favor the other side of the Cascades. I'm six years now, and this year is set to produce more than the previous five combined. Woohoo! First I want to make sure you are there. So, are you there??? Leave a reply and we can talk berries. I check my account often. I found the information about raspberries very helpful, but I wanted to point something important out that I believe was overlooked. You said that you used a 4x4 post to build a mason bee home, but you did not say whether the post was treated. Unfortunately, it is difficult for most people to find lumber of that size that is NOT treated and the chemicals in those treated posts are very toxic! Not only to bees but to pets and children as well. 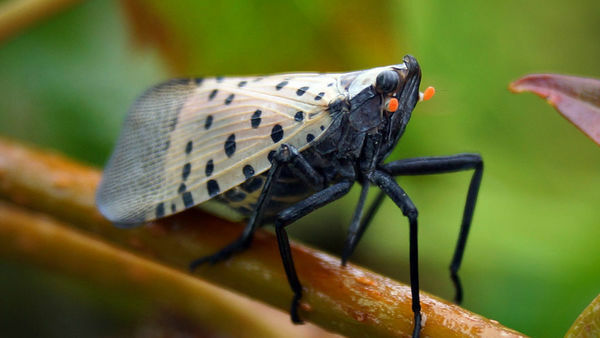 Despite the okay from government sources, other reputable sources who are a bit more concerned for our health and environment do not recommend using those in yards and gardens -- especially in areas where children and pets play or for beds containing food plants. I suggest using a chunk of wood made from an ordinary log. If necessary cut a flat back and face to make mounting easier, but otherwise leave it as nature intended. The bees will thank you. You can find cedar 4x4 or 4x6 posts at a lumber yard or even a fence company. Yes, that is true. My comment was for people who may not realize that there is a difference. How do you tell the difference between 1 year old & 2 year old canes? saw a diagram that showed daughter plants grow from first year canes and suckers grow from the roots......I just planted 1 rasberry plant this spring .... new to gardening. Are both daughters and suckers equally ok to replant or is there a difference in method? How deep do the holes need to be drilled to make the bee hotel work well? Hi! Great information. What is the lining inside the fence posts that make up your bed? I'm guessing it's not plywood, as that is chock full of chemicals, but I can't guess what else it might be.